Siemens is the brand we focus on and this is based on their level of technical innovation and quality. Siemens appliances are a premium brand of kitchen appliances and use innovative technology this is the brand we focus on based on their level of technical innovation and quality. They can achieve outstanding engineering with leading edge design and efficiency, providing kitchen appliance perfection and precision cooking. Siemens appliances utilise greener solutions saving water and energy providing you with many benefits. Combined with the sleek, modern designs, Siemens appliances offer a unique blend of style and efficiency. The IQ range consists of 3 sections. iQ700 – Exceptional design allied with serious innovative technology is the basis of these premium models. iQ500 – Exuding class and refinement, these machines unite first-class features with top class technology. Kuchen are proud to be associated with Siemens and are able to offer competitive quotes on the complete range whether or not you are buying one of our quality kitchens. The oven range provides coordinated and stylish products with technology on the inside that enables you to create and enjoy delicious meals. 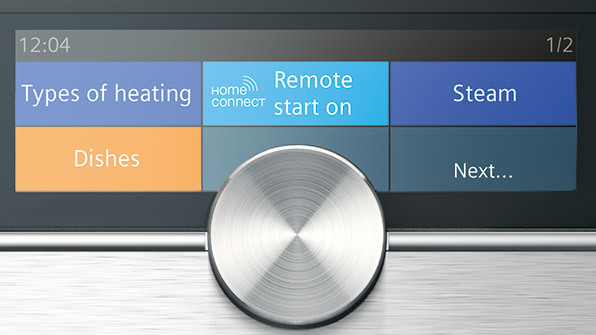 Uncluttered fascias feature high resolution displays and touch sensitive electronic controls. The complete design allows for perfect coordination between Siemens appliances. The oven cavities have a telescopic rail system that glides out effortlessly so you don’t need to reach inside a hot oven. Active Clean heats the oven cavity to 480C and burns away all debris from cooking leaving you with an immaculate oven interior. 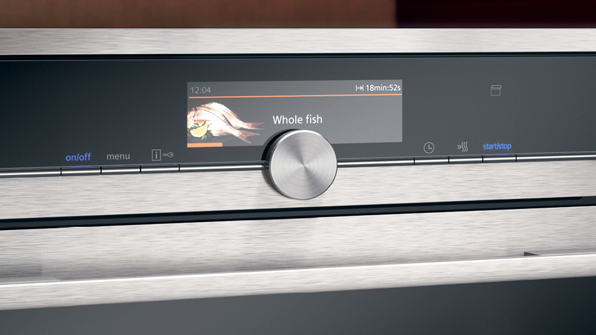 Siemens ovens have 68 automatic programmes and the oven recommends the correct settings for the meal you want to cook. 3D hot air cooking is the perfect time saver allowing you to cook sweet and savoury food at the same time. As the air flows over each shelf individually there is no mixing of flavours. The pizza setting is a favourite and is perfect for crisping bases on pizzas. The oven range provides coordinated and stylish products with technology on the inside that enables you to create and enjoy delicious meals. Uncluttered fascias feature high resolution displays and touch sensitive electronic controls. The complete design allows for perfect coordination between Siemens appliances. The oven cavities have a telescopic rail system that glides out effortlessly so you don’t need to reach inside a hot oven. Active Clean heats the oven cavity to 480C and burns away all debris from cooking leaving you with an immaculate oven interior. Siemens ovens have 68 automatic programmes and the oven recommends the correct settings for the meal you want to cook. 3D hot air cooking is the perfect time saver allowing you to cook sweet and savoury food at the same time. As the air flows over each shelf individually there is no mixing of flavours. The pizza setting is a favourite and is perfect for crisping bases on pizzas. 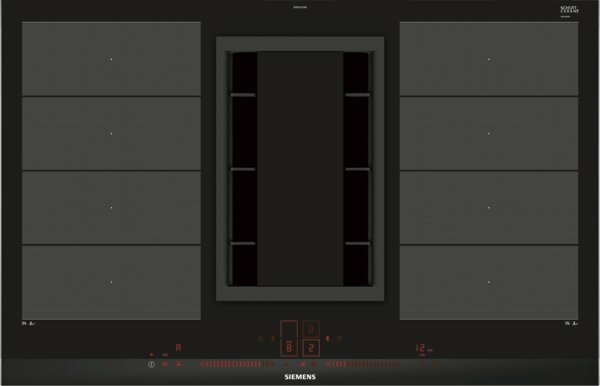 Ovens that are wifi connected allow you to control them from an app on your phone are one of the latest innovations. Imagine arriving home to an oven ready meal. 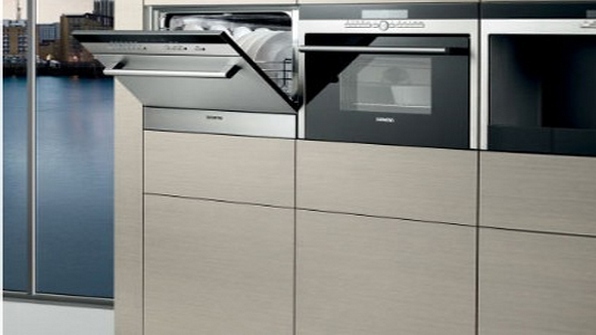 The ovens offer combinations of full fan oven, steam oven and microwave. TFT displays offer easy operation and cookControl (cookcontrol) electronic roasting is yet another leading edge function that makes for perfect roasting every time. This is an extensive range of induction and gas hobs. Induction cooking is the quickest, safest and most efficient method of cooking. When a pan with a ferrous base is used the coil below the ceramic surface uses an electromagnetic field to create heat almost instantly heating the pan. Only the base of the pan is heated leaving the hob surface cool. 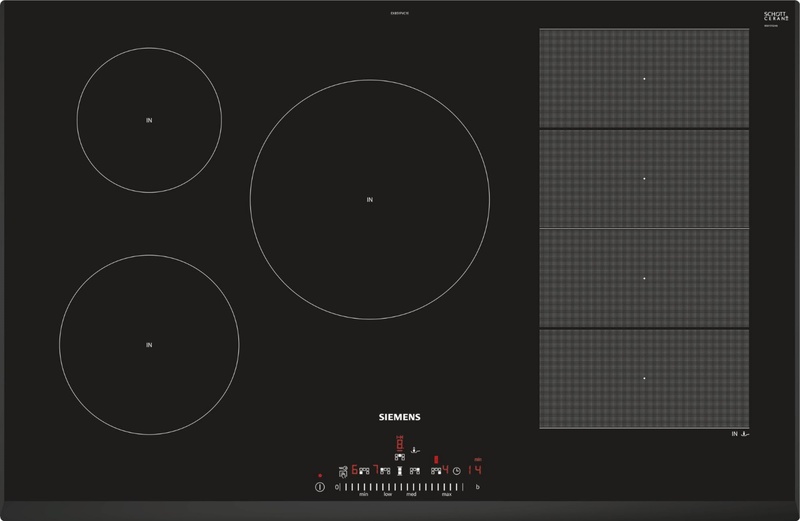 Siemens gas hobs are available in a wide range of designs all using the highest quality materials giving you the choice of glass or stainless steel combined with cast iron pan stands. Choose from a range of widths and burner arrangements that include high efficiency WOK burners. The new combined induction hob with downdraft extractor frees up wall unit space above the hob or the need for an extractor over an island. It also dries the air so you can install it without an external vent. The flex induction hobs provide maximum efficiency on the cooking area as you can place pans wherever you like. Use touchSlider functions for easy control, fryingSensor plus to prevent burning and powerBoost for rapid heat. Whether its an American fridge freezer or a built in fridge freezer they all share a wow factor that includes energy efficiency and storage solutions that will suit your lifestyle. Intelligent no-frost uses an air circulation system to stop the buildup of frost and ice. With features such as vitafresh, coolbox, hydrorush and airfresh filters you can be assured of fresh and enticing food kept that way for the longest possible time. 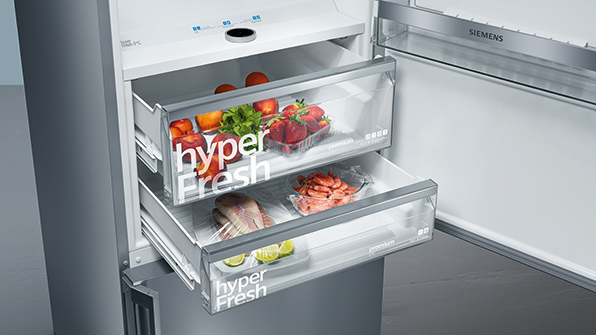 Then there are fridges with hyperFresh premium that keeps food fresh for 3 times longer. 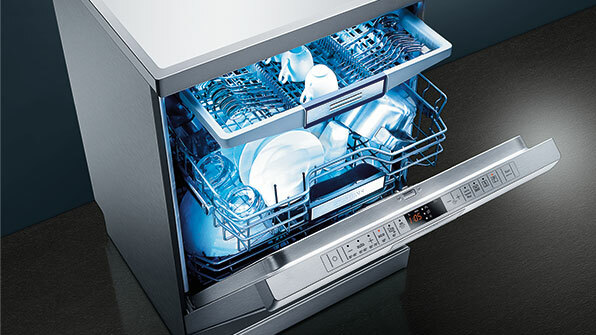 The dishwashers can feature cutlery drawers, adjustable racks and turboSpeed programmes for sparkling clean dishes every time.